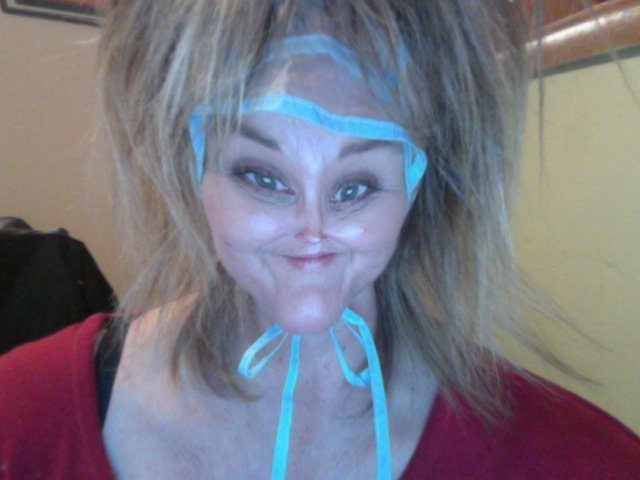 This is a photo of me putting dye in my hair and what I may actually look like when I am blogging with you. 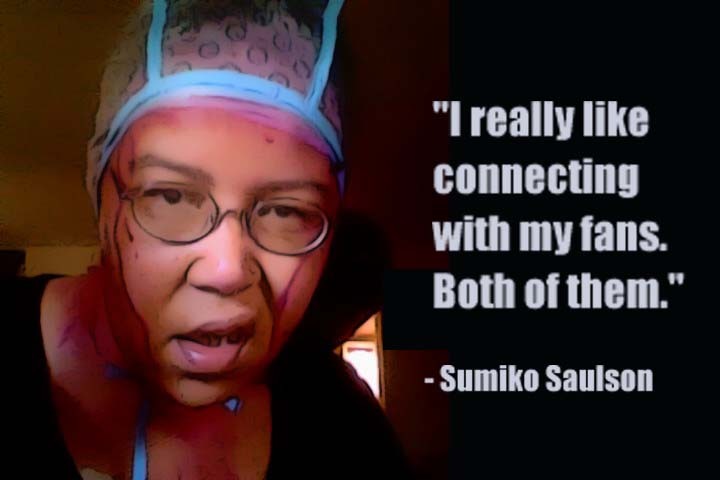 I like connecting with my fans… and you can find me @sumikoska on Twitter. My author page on Facebook is www.facebook.com/authorsumikosaulson – you can easily like it over on that side bar. Misty from Oregon in commiserating cap. You know what else? I also have a Google+ and a MySpace account, which I, like most other people in the universe, almost never use. But you know, if you are on MySpace just leave a comment below asking for my Myspace address. Not because it’s too hard to leave the address here, but because I really must meet the only other person on earth who still checks their MySpace account. When you like my facebook page, you will meet fabulous people, like this fan from Washington, who immediately sent me a commiserating photo of herself in a matching weave cap. Thank you, Misty from Oregon. Misty also knows Jody at The Secret Chicken. I am now demanding photos of chickens in weave caps. ~ by Sumiko Saulson on September 11, 2012. Ahhh, myspace…I would check mine but it seems last time I was on there, it had glitches that I just couldn’t quite figure out! I miss it, hop on on the very rare occasion, but still have my GET OUT OF MYSPACE tee shirt! lol! Yea. The last time I logged into MySpace I’m pretty sure I saw a tumbleweed blowing past my screen and heard crickets chirping in the distance. Interesting. But.. I think I already have three books and I’m working on a fourth, the short story book. It might kind of oversaturate the market so to speak. What do you think? Hmmm, well I wouldn’t think so. I’ve found some inspiring and funny lines in your blogs so you could even do a calendar of one-liners taken directly from the blog. The possibilities are endless! 😀 It takes a lot to hold my attention with writing and even movies and you always catch my attention and hold it!